But such is life. It can get crazy out there but thats when the sweet and boozey can help. Well that and good friends who come into town for a visit. Or the friends that go for runs with you and don't stop even when they want to. Or the friends who will listen to you complain about the same thing over and over again. Does you mind ever just wander? When my mind begins to wander I over think things...seriously I am really bad about over thinking even the smallest things. Other times I dream...I dream about cakes and frosting that are light as clouds...about vacations...the future and what all it may hold. So yesterday when I was trying to determine what sort of chocolate dessert to make for another office birthday, I figured since St. Patty's day is around the corner, I would make a chocolate Guinness Cake. Then while I was laying in bed this morning I was dreaming about what kind of frosting to top this cake with...the result Baileys cream cheese frosting. Oh and did I mention I did this cake two ways. 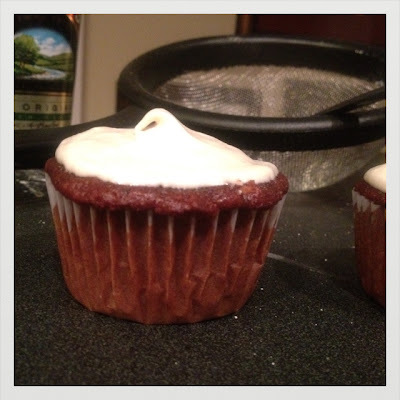 By the recipe, in cake form and then a "semi" gluten-free version, sweetened with agave nectar in cupcake form. Both turned out light and delicious. There are hints of Guinness and Baileys, that both go well with the light chocolaty cake and the creamy frosting for this almost Irish Car Bomb Cake. 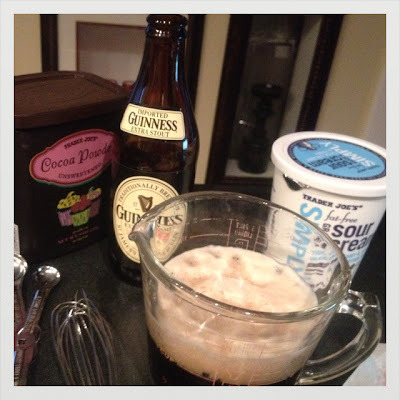 If you like Guinness or Baileys give this cake a try, it is easy and delicious. Enjoy! 1. Heat oven to 350 degrees F. Spray a 9-inch springform pan with non-stick cooking spray and line with parchment paper; then lightly "flour" with powdered sugar. Set aside. 2. In a large saucepan, combine Guinness and butter. Place over medium-low heat until butter melts, then remove from heat. 3. 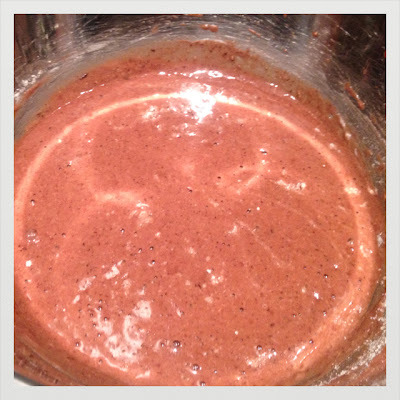 Whisk in the cocoa and superfine sugar (or agave nectar), and whisk to blend. 4. In a small bowl, combine sour cream, eggs and vanilla; mix well. Slowly whisk the Guinness mixture into the sour cream and eggs in an effot to temper the eggs. 5. Add flour and baking soda, and whisk again until just smooth. 6. Pour into prepared pan, (or cupcake liners) and bake until risen and firm, 45 minutes to one hour for cake (14-16 minutes for cupcakes). Place pan on a wire rack and cool completely in pan. Prepare the frosting while cake is cooling. 2. Mix in the Baileys until well combined. 3. With the mixer on low, mix in the powdered sugar one cup at a time until desired consistency is reached. For this cake/cupcakes I wanted the frosting to be super creamy and for there not to be a lot on each piece.